Jim Peirce stopped in Friday morning and dropped a memo on my desk. He had just left the bomb on Carefree Town Clerk Betsy Wise’s desk. Peirce was slated to run against Jim Van Allen in the General Election. Too bad his votes didn’t match the results of his Propositions which got huge votes, proving he knows the needs of Carefree. He is one of the few people who attends virtually every council meeting and was the brightest candidate running. I am sorry to see him resign and even sorrier about those who will celebrate his departure. It appears Cave Creek has no rear view mirror. There has been so much turnover in office the perception of the past seems lost. Recently, the council unanimously passed a bill to pave Morning Star Road. Morning Star connects Spur Cross Road with Old Stage Road in north Cave Creek and I drive it daily. When Spur Cross Ranch (SCR) was in play in the late 90s Morning Star Road and the area a few hundred feet to the south was unincorporated and many Creekers living in that area liked it that way. So an annexation committee was formed and promises were made to entice annexation. Citizens along Morning Star feared an east west corridor to give an eastern outlet from the proposed Cahava Springs development. As a consequence of concerns, Cave Creek agreed to not widen or pave the road for twenty years. Yet the contract with citizens was never discussed before the council voted to pave Morning Star Road. It is true the cost of maintaining Morning Star smooth and dust free is a huge expense, which paving would eventually mitigate, but a vote is required. Times have changed, especially the EPA’s PM 10 regulations for dust. Nonetheless, even though the issue of homeowner rights should have been covered before the council vote, it wasn’t and the council had the right to know – up front. This one is personal and has been going on for years. Maybe ten years ago the Hideaway biker bar sought approval to open. The council was leery because even if parking there was limited to motorcycles, there was not enough parking. Indian Village proprietor Bart Krasson’s dad was the landlord and he convinced the council overflow parking could go next door to the Horny Toad. It wasn’t long before Hideaway parking became a major nuisance and parking wasn’t allowed there. Horny Toad owner Jeff Price currently pays several hundred dollars every weekend to protect his parking lot for patrons. He has tried, as I have, to get town help and we are told it is a private property issue. We are on our own. Sonoran News is located next door to the Sonoran Suds Laundromat. On busy weekends Hideaway cars and motorcycles take over the parking lot and the laundromat cannot be accessed by customers. Certified letters to the Hideaway owner, Mark Bradshaw were ignored. Sometimes other tenants are affected if they try to work weekends and with a new gun store opening in the shopping center the problem will be exacerbated. To determine if your vehicle has been towed! Per 24-hour period or part thereof. These signs were posted in six locations with printed copies in the window of local businesses. Even so when violators were confronted their answer is always, “What signs? After numerous complaints from other tenants I called a tow truck to begin by towing an SUV with Hideaway markings all over it. As the tow truck employees cranked the vehicle up on their flat bed a screaming, cursing woman came flying over complaining with all kinds of threats. She was followed by the peacemaker from the Hideaway who spent an hour negotiating with the tow truck driver and then gave the driver $100 to unload the Hideaway vehicle. Then the Hideaway peacemaker promised they would no longer have customers park here. 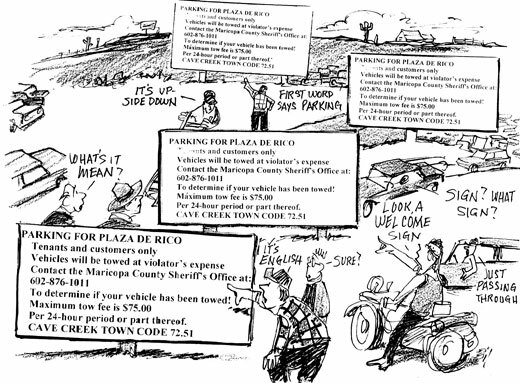 During the very next week Hideaway employees advised parking seekers to park in Plaza de Rico. Since that time our parking lot has been sporadically flooded with illegal parking. I hired a woman to close the parking lot except for tenants and customers. Although she was effective, she endured spiteful complaints. One woman, after trying to claim she was going to the gun store (it hadn’t yet been opened), then tried the same with the chiropractor's office, which also was closed. Then, for spite, she called MCSO claiming she had been harassed. They arrived, admitted they didn’t have jurisdiction but nonetheless lectured the woman controlling the parking lot and left after saying if she doesn’t move her vehicle go ahead and tow her car. On another occasion, the parking attendant spent the day collecting $10 for parking and she filled the parking lot. Although that sounds like a good business proposition it involves coordination with all businesses here to protect their interests and it is something we shouldn’t have to do. The signs are explicit and hopefully motorists can read. All of this rests at the feet of Hideaway owner Mark Bradshaw. Apparently the Circle K, which resides between us and the Hideaway, likes the business generated by flooding their parking lot with bikes and cars. They must get gobs of business but it encourages the bikers to park in any open spot they see. The council recently approved a special event permit for Bradshaw on T.C. Thorstensen’s commercial property west of the granite yard. Bradshaw tells confidants he wants that event to be the “Sturgis of the West” and contemplates attendance of 10,000 people. And where will that many people park? It seems to me the council approval should have included parking restrictions, which required Bradshaw to enforce parking where it isn’t wanted. He is required to deal with parking, restrooms, etc. as a condition of the special event permit. In the meanwhile we will aggressively tow offenders of the conditions of our signs.